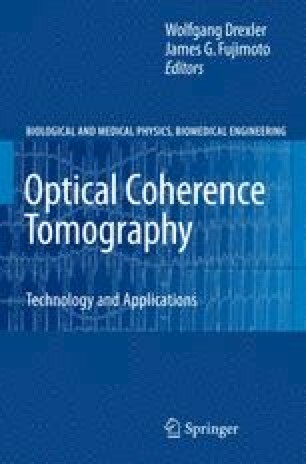 Over the last decade, noninvasive or minimally invasive spectroscopy and imaging techniques have witnessed widespread and exciting applications in biomedical diagnostics. Optical techniques that use the intrinsic optical properties of biological tissues, such as light scattering, absorption, polarization, and fluorescence, have many advantages over the conventional X-ray computed tomography, MRI, and ultrasound imaging in terms of safety, costs, contrast, and resolution features. Time-resolved, phase-resolved, and frequency-resolved optical techniques are capable of deep-imaging of the tissues that could provide information of tissue macrostructures and oxygenation states and detect brain and breast tumors [1, 2], whereas confocal microscopy and multiphoton excitation imaging have been used to show cellular and subcellular details of superficial living tissues [3, 4]. However, most biological tissues strongly scatter the probing light within the visible and near infrared range, i.e., the therapeutic and/or diagnostic optical window. The multiple scattering of light is detrimental to imaging contrast and resolution, which limits the effective probing depth to several hundred micrometers for the confocal microscopy and multiphoton excitation imaging techniques. However, some clinical applications, such as early cancer diagnosis, require the visualization of intermediate depth range of the localized anatomical structures with micron-scale resolution. This chapter is designed to introduce the effects of light scattering on OCT and discuss how multiple scattering of tissue would impact on the OCT imaging performances. We then elucidate the developments of techniques in reducing the overwhelming multiple scattering effects and improving imaging capabilities by the use of immersion techniques.